Amish shoo-fly pies "made from gooey molasses-based filling and sometimes topped with chocolate cream." Photo by Carol M. Highsmith c. 1980 from the Library of Congress. One of my favorite things to do when I am bored is to troll the Library of Congress digital collections (pushes up invisible nerd glasses). Of course I tend to look up topics I have a passionate interest in-- folk songs, hobos, and you guessed it, pies (and somehow those are all related. hmm...). I think I may have looked at all 1,785 entries for pie in the catalog. It's true. 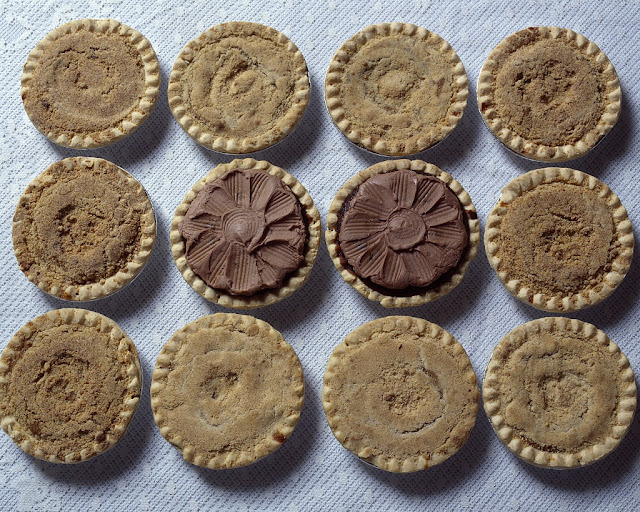 You'll be seeing more of my search results, but these two photos of Amish shoo-fly pies and whoopie pies from Lancaster, Pennsylvania caught my eye. Just today at work we were discussing the possibility of featuring Maryland Amish whoopie pie vendors at an event, and I've been doing some free-lance work transcribing interviews related to medicine in Amish communities. I also grew up in northern Indiana, where we went out for lunch at Das Dutchman Essenhaus, bought produce from Amish farmers at the Goshen Farmers' Market, and spotted buggies parked outside our local Target. When I lived here in D.C. previously, I once met up with my friend Francis Lam (of Gilt Taste and formerly of Salon.com and Gourmet Magazine, RIP) at the Dutch Country Farmers' Market in Burtonsville, Maryland. There we wandered through the rows of vendors, taking in the sights of blaze orange cheese mixtures, mayonnaise-based casseroles, and strange pickled things, and picked up some to take home. I definitely snagged a whoopie pie or two and remember thinking it interesting that the baker's crescent-shaped fried pies or hand pies were called "moon pies," which to most of America, or at least south of the Mason-Dixon line, means something else entirely. Amish whoopie pies "a surprisingly sinful treat." There's something weird about these photos (or is it just me?). Though they are lined up in almost perfect rows according to color and variety, they still seem to be shot without artifice, sans any of today's bloggy food styling, as if they could appear in your middle school home-ec class textbook with a simple caption "Amish desserts". All the while, there is something appealing about them--I'd totally chomp into one of those oatmeal whoopie pies or chocolate covered shoo-fly pies given the chance. I should probably plan a return trip to the Dutch Country Market or whip up some oatmeal pies of my own? Shoo fly, don't bother me. 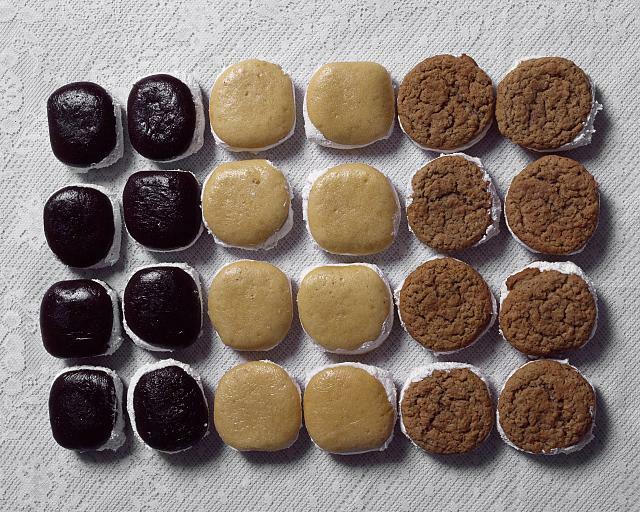 We made whoopie pies growing up in central PA. Always a favorite. Just found your blog. looking forward to reading more. it all looks super. The 3rd annual Neelyhouse Pie Party is coming up on May 12. If you are anywhere near, you should come! wow that pie party looks INCREDIBLE!!! glad you found the blog and thanks for sharing!